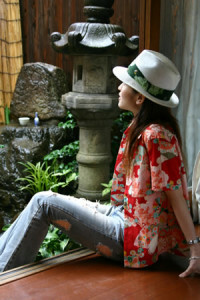 The origin of Aloha shirts was that migrant Japanese remade their Kimono to Aloha shirts. 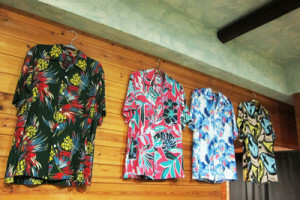 I didn’t know this story until researching Aloha shirts this time. It’s interesting history. I should proud of Japanese Hawaiian migrant. They contribute beautiful fashion heritage to us! Many Japanese migrated to Hawaii in the years between the end of the 19th and the start of the 20th centuries. They crossed the seas with dreams of a new world, escaping the poverty of life in Japan. 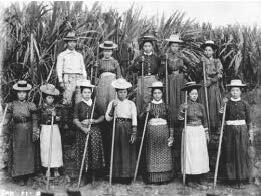 Most became workers on the sugar cane fields. In those days, the work garment worn by plantation labours was an open-necked cotton shirt known as a “palaka.” Palakas had a texture very similar to the splashed pattern that the Japanese were intimately familiar with. Consequently, many Japanese immigrants used to wear this shirt regularly. Apparently, the current-day aloha shirt was modelled on the palaka. 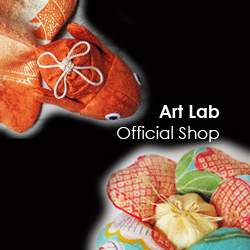 Japanese immigrants would only wear the kimono that they brought with them from Japan on special occasions. When adult-sized kimonos became threadbare and could no longer be worn, the usable sections would be cut out and re-sewn to create palaka-style shirts for children to wear. The characteristic colors and patterns of the kimono fabric used for these shirts were seen as fresh, exotic, and stylish by the Hawaiian locals. During the early 1900s, locals who had come across palaka-style shirts worn by the Japanese started to make and wear shirts that imitated these, using yukata fabric or other fabrics available on the market.